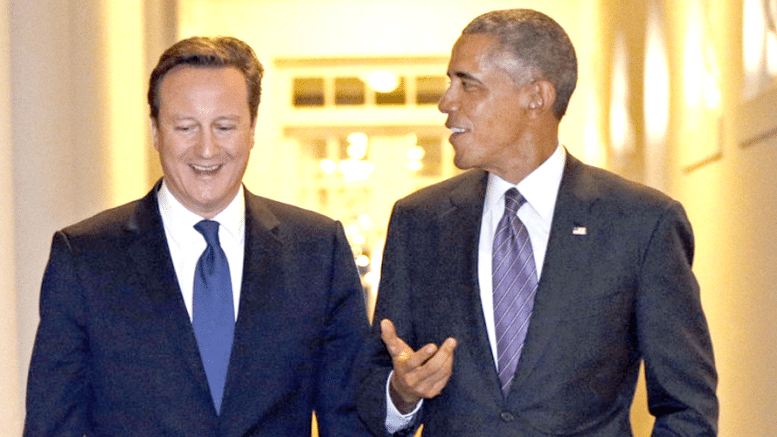 Hussein Obama wrote an op-ed to the people of Great Britain, supposedly in an effort to help Prime Minister David Cameron prevent Britain’s exit from the failed world government stepping stone, the European Union. It was published in the Telegraph and was timed to coincide with the arrival of Obama in country. He titled the piece “As your friend, let me say the EU makes Britain even greater.” First of all, Obama is no of any European or North American Christian nation. He’s a friend of the globalists who run the EU out of Brussels and of those intent on creating continental Islamic caliphates in Europe and North America. It’s their interests that he’s concerned with. In providing a foundation for his arguments, Obama referenced the international wealth redistribution and sovereignty killing global entanglements of the past and present as somehow being reasons for Britain staying put and continuing to suffer from the self-inflicted injury of border degradation and economic and cultural dilution. Those are the words of a pretend ‘president’ who presides over a nation that has been at war virtually non-stop since the end of World War 2, with only brief interruptions for retooling or resupply. Those international organizations are the result more of a lack of foresight, which continues to this day, as to the extent and the nature of the threat to the sovereignty of individual nations. It is that threat to liberty that Obama is acting to perpetuate and protect, not any false, nonexistent peace. He makes his ridiculous claims as he advances the other side of the argument, that both Europe and North America must throw their doors open to a massive flood of people supposedly fleeing the “ravages of war” in Syria. It’s widely acknowledged that the only requirement for being classified as a “non-economic Syrian refugee” is the ownership of a prayer rug, a Koran, a bad attitude towards Christians and a belief that they must convert or suffer the consequences. He writes that the “challenges of terrorism and aggression; migration and economic headwinds” can only be effectively met by the combined efforts of two nations, Britain and America. So there’s no need to worry. Mr. Fixit is on the job and he’s going to have meetings with David Cameron. Soon everything will be just dandy once again. If that’s the case, Britain and The US can handle it, is he then arguing against the EU as well? Of course not, it’s just one of those inevitable contradictions that come with filling a speech full of lies. Globalism for his own financial benefit and that of his fellow oligarchs is how he defines global growth. It’s a greater presence in the interest of profit and so that his “young people,” those two girls that occupy the White House with him, can prosper. He didn’t mean any of our kids. Mr. Hope and Change is in Britain for the explicit purpose of stifling change and with it hope for Britain’s future. Obama’s making this trip to continue business as usual. It’s a PR stunt designed solely to defeat Britain’s Brexit movement. There is nothing of any substance beyond maintaining the status quo that he is advancing or advocating. In arguing for the continued degradation of sovereignty among nations and their melding into the UN world government, Obama was forced by the restrictions of language and words to admit at times his true intentions, though only for those willing to hear. He wrote, “And in today’s world, even as we all cherish our sovereignty, the nations who wield their influence most effectively are the nations that do it through the collective action that today’s challenges demand.” Collectivism is the subjugation of the individual to a group, a global government, Soviet style. The evolution of the EU en route to one world rule. The dangerous liberal went on to cite his “successes” in the Iran deal and the Climate hoax as reasons why Britain should remain in the EU, claiming that the voices of the individual were magnified by submitting to the will of the foreign masters. He declared the “economic benefit” of the job killing Transatlantic Trade and Investment Partnership as a benefit of EU membership. He also hyped the supposed exchange of terrorist fighting information, a miserable failure highlighted in Brussels, that is only going to become more dangerous as the EU spreads terrorist cells throughout the continent. Maybe Obama doesn’t realize how idiotic he sounds or what a jackass the world sees him as, but it’s certainly obvious he doesn’t care. He’ll say anything and in doing so has inadvertently made the case for Britain’s exit from the European Union in the strongest of terms. 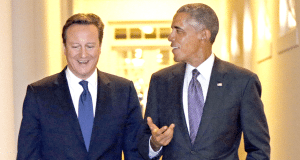 Simply put, if Obama is against it, Brexit’s got to be a good deal for Britain, and America. Neck And Neck, Really? Cruz Never has Crowds Like This – Who’s Counting The Votes?